This week I attended the UK launch of the Roadmap to 2050, an initiative of the European Climate Foundation that charts a series of ambitious low emission pathways for the EU to follow over the next 40 years. I discussed the Roadmap in a previous posting. Like nearly all similar “roadmap” analyses, the Roadmap to 2050 calls for a step change in energy efficiency as one of the major component parts of its plan for Europe. They are right, it almost certainly has to happen, not just in the EU but globally. However, there are two sides to the energy efficiency debate and we tend to only talk about the one which results in lower energy demand as part of an emissions reduction strategy. The other side is quite the opposite. It even has a name, the Jevons paradox, sometimes called the Jevons effect. Wikipedia will tell you that it is the proposition that technological progress that increases the efficiency with which a resource is used tends to increase (rather than decrease) the rate of consumption of that resource. In 1865, the English economist William Stanley Jevons observed that technological improvements that increased the efficiency of coal use led to the increased consumption of coal in a wide range of industries. He argued that, contrary to common intuition, technological improvements could not be relied upon to reduce fuel consumption. The evidence supporting this effect is limited, in large part because of the difficulty in separating the direct and indirect effects of improving energy efficiency. For example, does an improvement in vehicle efficiency mean that the lower running costs result in more miles driven or does the money saved get put towards a more expensive holiday, perhaps including long distance air travel. Or does it simply result in a drop in energy demand within the economy which drives down prices (and in turn supports even more demand somewhere else). There is plenty of anecdotal evidence. In my own case it relates to air conditioning and heating in Australia. I recall as a teenager when family friends bought a house that included a central air conditioning system – something largely unheard of in Australia in the 1970s. Owning it was one thing, but running it was another. They hardly ever did because of the high electricity bills. Today, air conditioning is quite common in Australia and the units are much more efficient. As such, the cost of running it isn’t such a big deal. The same is true of air conditioning in cars – once a luxury item in large cars with big power trains, it is now standard on almost every model and as such consumes fuel in all those vehicles. There is also quite some academic discussion on the issue, but again the picture is mixed. A good summary paper on the issue is Jevons’ Paradox revisited: The evidence for backfire from improved energy efficiency. 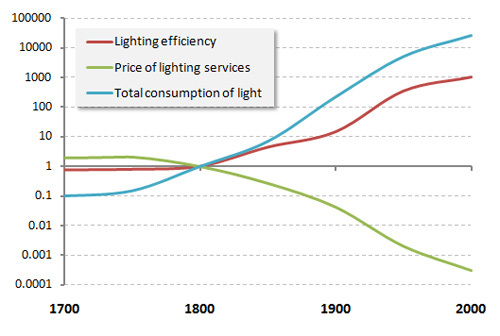 (2009) Sorrell, S. Some interesting data is presented (Fouquet and Pearson, 2006) which shows how the huge improvements in the lighting efficiency and the cost of lighting have driven demand ever higher, which of course raises the issue as to what happens as very efficient LED lighting becomes widely available. Perhaps the answer here is to simply accept the potential of the Jevons Paradox and recognize that it will play out globally as energy use expands with development and technological innovation. But we should also recognize that without the technological progress that creates the effect, billions of people globally may not see the rapid increase in their standard of living that they strive for, particularly in developing countries. At the same time, it means that the focus on emission reduction / emission free energy technologies such as carbon capture and storage, wind, solar and biomass must be significantly stepped up not only to help meet growing energy needs but to do it while sharply reducing emissions.